Everybody loses, but learning from those games makes you a winner. In today’s post I want to show a game that I lost but in return taught me the fundamental thematic ideas in the King’s Indian Defense. Heading into this game, I was 1.5/3 at the National Chess Congress in Philadelphia, so for me, this was a must win game. Back then, I didn’t play as aggressively, but in this round I just attacked and attacked. While I lost, I discovered the importance of thematic ideas. 9…Ne8 Up to this point so far so good. Unfortunately, my knight on c5 was easily attacked later in the game, and cost me a bunch of tempi. Because of this game, I learned that I should play a7–a5 to solidify my knight on c5 and sustain pressure on e4. 11…f4! This is a critical pawn push in many closed positions. The idea is to close off the White pieces from the kingside. 13…h5?! This is in the right spirit, but not the most efficient or orthodox way to attack the kingside. I need to play …Nf6 followed by a g–pawn push. By moving the knight, I would have brought in an additional piece. 14…h4? Not a blunder, but terribly inefficient. Having moved the h–pawn, it makes my kingside attack awkward. 16…Nb8 Not a fun concession. By allowing White to attack my knight, he has successfully expanded the queenside and is ready to attack. If anything, he is slightly better. 24…hxg2? White doesn’t have to take. In fact, by keeping his king on g1, he is perfectly safe. Meanwhile I had missed 25. Bb4. 26. Nc3? A good bluff from me scared my opponent. White should have taken the rook since my bishop would not be able to go from f8 to c5 because of the knight. However, by moving the knight to c3, White actually makes it impossible to take the rook. 35…Qd8?? While there is no easy win for me I am slightly better. By trading queens, I have no active pieces left, making the endgame an easy conversion for white. While I lost, I learned a lot about attacking chess in this game. I saw how playing a7–a5 would have been a game changer for me, and I saw how a g–pawn push would have been much more methodical. By learning these ideas, I was able to win many games, this one a year later in Atlanta. 8…a5! Not a brilliancy, but this move shows that I had learned from the previous game. 10…Ne8 Unlike the other game, I can attack without worrying about my knight on c5. My position is a lot more simple. 11. b3 Because I played a7–a5, my opponent has to play the much slower b3, a3, b4 idea. This gives me more time to expand on the kingside. 13…b6! The simple solution. My knight will go back to b7, covering c5, making my opponent’s life even more difficult. 17…g5! Again this is a much more effective way of undermining f3. 22…Ne3 Because I played the right idea, my attack is much more effective. Now I have an outpost on e3. 32…Ng5 I have more active pieces, and while the game isn’t won yet, its much easier to play with black. 38…Bxh1 –+ By eliminating White’s defender, I now have much more play. The knight and bishop on b2 and c3 are doing absolutely nothing. By learning from an earlier loss, I actually became a better player, and my understanding of the King’s Indian grew substantially. If you think the game was a tough loss, then you probably were doing something right. Analyze and figure out what you need to tweak. 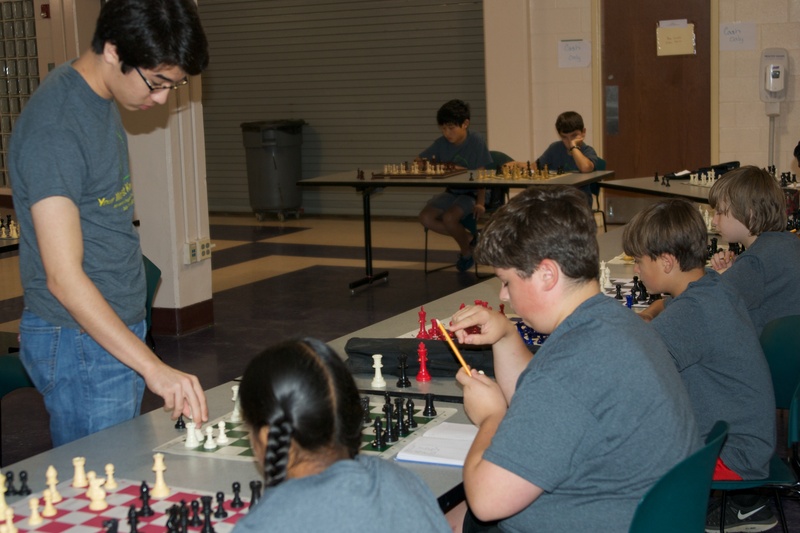 In my experience, chess is defined by wins and losses, not by quality of play, especially at the scholastic level. Unfortunately, this is a grave misconception. A competitive player should let every game be a stepping stone, or a lesson. Often times I find that parents of young players react more to a result than a quality game or best effort. Typically, these parents aren’t exactly chess masters. They know what ratings are and what they mean, and they see each game as a statistic; being 100 rating points lower than the opponent is a huge disadvantage, and the higher player should always convert. This is exactly the wrong mentality, things happen and players make mistakes. For any chess parents out there reading my blog, let the coach decide if the match was well played, especially if your child is higher rated than you. I began this post with this intro because I wanted to show that you do not have to win to play a respectable game. Today’s game is a match I played in November 2013 at the Northern Virginia Open. I was playing a 2000+ rated player, so for me, it was of the upmost importance to focus on playing the best chess I could. Even though I had just broken 1900, playing expert players was a rare opportunity. While I drew this game, it is extremely important to understand that at no point I was playing for a draw. If you play for a draw against a strong opponent, you will lose. If you play for a win against a strong opponent, anything can happen. Just make the best moves you can make and play along. 10. Nxd4 A different idea for me. If you read my last post, I got the idea from the Franco–Steincamp game in which I failed to find a strong defense. By playing this move, I avoid immediately accepting isolated pawns. This is important because now if Black exchanges on d4, my bishop from g2 is not blocked by the knight from f3. 11. Nce2 Perhaps not the best way of going about things. The bishop on g7 is becoming stronger and I didn’t accomplish anything substantial with this move. In reflection, I would have considered 11. Qb3, with the idea of attacking d5. Nonetheless, the game is still very much in the balance. 12. b3?! A risky idea, but one worth trying. I have to keep an eye out for any tactics as a result of the pin. If I were a more passive player, I think I would have further delayed the development of the c1 bishop, but this position mandates rapid development. 13. Ba3 Black’s pieces are better placed, but this move is certainly more challenging to deal with than 13. Bb2. By pinning the knight, I give myself time to move my rook from a1. 15…b6 Black cannot take on a2, as the queen will be trapped after Ra1, followed by Ba3. By playing b7–b6, my g2 bishop gets some more scope, and with the exception of my opponent’s isolated pawn, the pawn structures for both sides are identical. I have solved all of my opening problems, and could even be slightly better. 21…Bd6 I was fairly surprised to see this move, as the bishop was far better placed on g7. While black has the pair of bishops, it is not quite clear how his light squared bishop will join the fight. 24. Nc3 An important idea, as black has no entry into my position. Meanwhile, it is clear that the pawn on d5 will weigh him down. 27…a5 In this position, it is very clear that the pair of bishops does not yield any advantage. This position is probably equal, but I played along to see if I could undermine his isolated pawn. I hope by showing this game I conveyed that it is perfectly possible to play a strong game of chess without getting a winning result. In this game, I challenged myself to find ways to eliminate the pressure of the g7 bishop while undermining the d5 pawn. It is extremely important to plan in chess. Find a solid plan and execute it. In this game, while I was happy with a draw, I knew that I did everything I could and a better result was not possible. Always play your best. So I’m back from the World Open! I finished the U2000 section with 2 wins and 7 draws, but no losses. While I didn’t reach my goal, I did finish higher than I came in, and still gained rating points. Here is my first game. I think that in this game, I got off to a slightly worse position, but found a way to turn the result around. 3.c3 This is the Smith–Morra Gambit, probably the last opening I wanted to play against a lower rated player in the first round. 7.Bc4 I thought this was an odd idea, 7. Bb5+ is the main line, followed by 7… Nbd7 8. d6 exd6. 11.Qf3 Despite awkward placement for the bishop, white has found a way to attack the kingside. 13.h4 This move scared me a bit, even though there is nothing in it. I played 13… Qf6? Thinking that I could trade queens, but after 14. Qh3, I have to move my queen due to the threat of Bg5, and a following queen trap. 14…Qe7 Due to the wasted move, I stand slightly worse. 15.g4? This is actually a mistake. But its hard to find the reason, isn’t it? This move doesn’t really threaten anything immediate, and gives me a free move to try to get back in the game. 15…Bxe5! This is the decisive moment. Despite being under attack, I trade my fianchettoed bishop for his e5 knight. In order to make this move, I had to find a string of forcing moves. 15… Qb4+ isn’t nearly as strong, because I won’t be able to put my queen on e4. 18.Kd1? My opponent flinches, and concedes that there is no perfect defense with this move. Now that white can’t castle, it will be very easy for me to find a win. 20….Qxf3+ Not the best move. In this game, it never occurred to me that the knight can be overloaded from g1. 20… Be2+ wins on the spot, if 21. Nxe2 Qxf3 –+ or 21. Kc1 Rfc8+ –+. 22…Rac8+ No need to take the knight yet, need to improve my position first. 23.Bc3 Bxf3 24.Rh2 Nbd5 25.Re1 Nxc3 26.bxc3 Bxg4 27.f3 Bf5+ and white resigned. I thought that this was a interesting game because if I didn’t find 15…Bxe5, I don’t think I could have still won in such a fashion. The key is, always look for active play, as the best defense is a great offense. If you’ve been reading my blog, you’ll know that this week is the 42nd Annual World Open . I’ll be leaving tomorrow, so in all likelihood, this will be my last post until I get back. Chess is a lot like ancient Greek warfare. Each soldier would line up with both a large shield (pawns) , and a spear/sword (pieces). After a few fights, it was noted that to attack with the spear alone was difficult, and had limited levels of success with high casualty rates. Greek generals opted to use the shield instead, with the goal of pushing the opponent of the field (gaining space). However, shields don’t kill people. A side only won the battle if the other side ran away and opened the potential to be stabbed by turning their backs (retreat). This battle strategy seems fairly basic, but it actually is important to understanding space in chess. I thought for today’s post I’ll share my first game where I outplayed and beat a 1700 (I’d beaten one 1700 before, but he had hung a rook in a winning position, so that doesn’t really count). When I played this game, I had just broken 1500, so there are a couple obvious missteps I made, but nonetheless, I think it is a good example of “Greek Warfare” chess. 3. e3?! I tried to avoid all Queen’s Gambit Declined theory in all my games when I was younger. Obviously, this is not such a good idea, but when you are constantly playing up, it is sometimes advantageous to play non–main line moves to throw off your higher rated opponent. 6. a3? This is not so much a mistake, but an unnecessary precaution. If I played this game today, I might try 6. cxd5, trying to reach a Carlsbad pawn structure. 9. dxc5 One of the reasons I became a stronger player was my ability to expand on the queenside and gain space. My idea is to immediately follow up with b2–b4. 11…exd5?! This move creates an isolated pawn in the center. While White can force Black to have an isolated pawn, he should have played …Nxd5 first trying to trade down before creating the weakness. 12. Nd4! The critical idea. By creating a blockade, black cannot push the d5 pawn to d4 with hopes of a trade. Now I have the option to try Be2–f3 and put pressure on the blocked pawn. 16. f4 My computer believes that this is the best move, but I don’t think it is the most principled approach. My pawn on e3 is backwards and if black can trade down, a rook on e8 could spell problems for me. The reason I played this move is because it gained space on the kingside. Black is playing very passively, and is letting me do what I want with the position. 20. Bg5! The whole point of 17…Nxe6. Black’s pawn on e6 is way weaker than the former isolated pawn was on d5. Even if this move does not win a pawn (it does), my development alone is enough for me to have a significant advantage. 24. Qd4? My first real “miss” in the game. I don’t have record of if I was in time pressure, so I don’t know how I missed this opportunity and later tactics in the game. Much better is the hard–to–find 24. Nc7! If Black tries to keep his bishop with 24… Bxc7 25. Qxd7 Qg8 to stop mate 26. Rxc7 Rf7 is the only way to stop the threat of Qxg7+ followed by Rc8. 27. Qxf7 +- and Black could have easily resigned. At least on the bright side, 24. Qd4 still gives me an advantage. 30…Qe7 The queen was overloaded, guarding both back rank mate, and the rook. Unfortunately, black will lose the queen regardless of what he does. The queen most move in response to the threat from the knight, and Bxg7+ is a very strong possibility. After 30… Qf7 31. Qd8+ and mate will follow shortly. Even though I missed some tactical opportunities in this game, it became very clear that I got a strong advantage after acquiring a lot of space. Because Black did very little to contest both the center and the wings, I was able to expand on both sides, while toggling my pieces to attack my opponent’s weak central pawns. I think one key takeaway from this game is that you can’t get by playing passively. Unfortunately, there are some players who think that good defense and passive play are the same thing, so choose to make nothing moves in complicated positions. However, there is a critical difference between these two ideas. In my ten years of competitive play, I don’t think I’ve ever heard a master say: “This is a very strong passive move.” The reason is, strong defensive play means that the defender is always creating areas for counter play, and is ready to pounce should the attacker make a mistake. With a passive player, there is no such thing. In this game, my opponent played extremely passively. For example, you may have noticed that my opponent played 15… Qb8?! and from that square, it effectively did nothing for the rest of the game, and when it did move, all it did was defend from f8. As I created space, my opponent chose to give it to me.